On the agenda for this meeting: Update on GA 6th, MT and SC 5th house races. Brainstorming: what can the Elections team do to make a difference? We will also discuss the upcoming special election for Ken Donnelly's State senate seat. On the agenda: Formulate the talking points/emails for out-of-state friends based on HC & Outreach scripts. 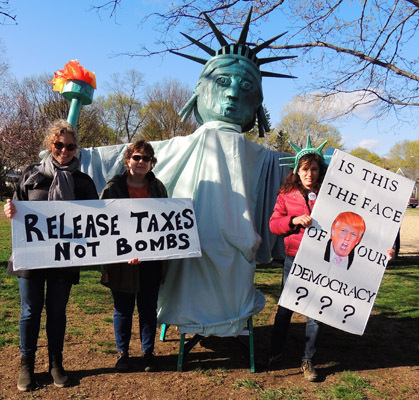 On Tuesday, Tax Day, over eighty people came out to demand tax transparency from our 45th president, even as he tweeted "Someone should look into who paid for the small organized rallies" Well, we were all out there to declare loudly "No one is paying us to protest and we demand financial transparency!" In addition to MI members, Lexington Selectman Joe Pato came out for the cause and said a few inspirational words, as did Cindy Friedman, Chief of Staff for the late Senator Ken Donnelly. Ms. Friedman is widely expected to announce her candidacy for Senator Donnelly's seat. 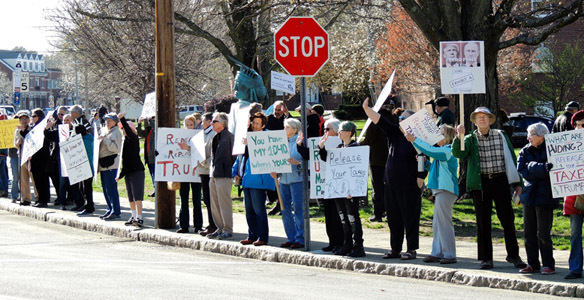 We had Lady Liberty in attendance thanks to the fine folks at the Monroe Center for the Arts and a welcome turnout from members of the Battle Road Action Committee and other local Indivisible groups from Concord and Acton. On Monday, we also marched in the Lexington Patriot's Day Parade, celebrating the original American resistors to tyranny. We are reminded that although that first battle on Battle Green was an inauspicious beginning, that, ultimately, those fighting for the rights and freedoms of the citizenry prevailed and a great democracy was born. We honor them and stand up for those hard-fought freedoms and institutions of justice which make this country great. The state senate announced party primaries will be held on June 27 and the final election on July 25 in the 4th Middlesex District. The district includes the city of Woburn; the towns of Arlington, Billerica and Burlington; and much of the town of Lexington. We know of three Democratic candidates that have announced or are considering run for this seat: State Rep Sean Garbally formally announced his candidacy. Senator Donnelly's Chief of Staff Cindy Friedman is expected to announce shortly as well as Mary Ann Stewart. Ms. Stewart is an activist for the Fair Share Amendment, serves on educational boards and is a Lexington Town Meeting Rep. If you would like to get involved in this election, please join us at an elections team meeting. One is being held this evening, Thursday, April 20th at the Lexington Community Center at 7:00. 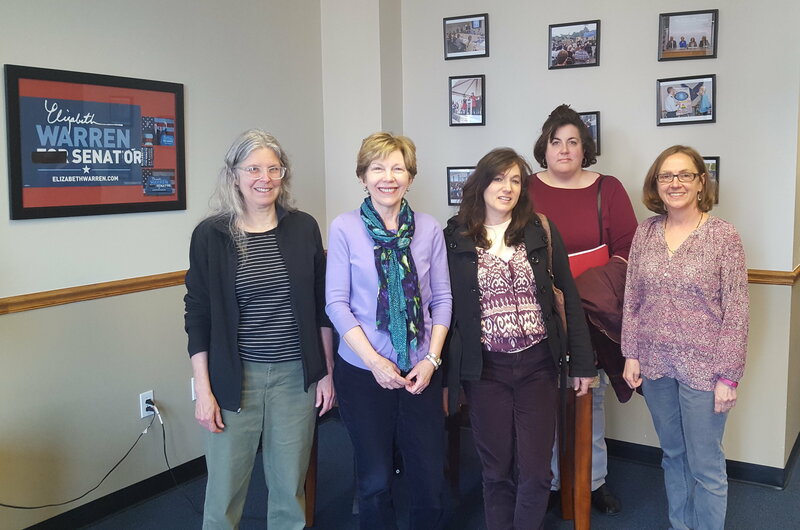 MI Members Lisa Baci, Debbie Armstrong, Nancy Gold, Kim Wright and Marci Cemeska paid a visit to the Boston offices of US Senators Markey and Warren to discuss "Russiagate" and the financial conflicts in the Trump administration. They spoke with two staffers about those topics as well as a wide-range of other issues including the need for congressional authorization for the use of military force, the upcoming deadline for federal budget funding as well as Data Protection legislation recently introduced by Markey. Tell Your MoC's to Leave Trumpcare in the Garbage where it Belongs! Breaking news reports indicate that members of the right-wing Freedom Caucus may have reached an agreement with the Republican moderate Tuesday Group to revise and re-ignite Trumpcare. Details are still scarce, but undoubtedly this new proposal will be an even further stripping of the ACA. Please put down your coffee and dial up your MoCs now. Tell them that any reduction to the ACA is unacceptable. We need to fix it, not strip it. Even better, call your friends and relatives in red districts and ask them to do the same. Your MoC contact details are here. The Massachusetts House of Representatives is currently considering amendments to the 2018 proposed budget. State agencies need adequate funding to prevent and address pollution, ensure clean water and make the Commonwealth more resilient to climate change. Please urge your State Representative to co-sponsor the Green Budget amendments today! The Amendments are #1196, 839, 898, 1073, 830. The House takes up the budget next week, so please call and/or email asap. For those of you in Jay Kaufman's district his contact details are here. Otherwise, you can find your rep. here. A group of six Republican lawmakers in Massachusetts just bucked the trend of their cohort in DC and proposed data privacy legislation that bars Massachusetts Internet Service Providers from using or selling their customers’ internet browsing histories and other sensitive personal data without getting the customers’ explicit permission. This runs counter to the repeal of similar legislation nationally. Call your state reps. to voice your support for this bill. For those of you in Jay Kaufman's district his contact details are here. Otherwise, you can find your rep. here. Outreach for Financial Transparency: Have Connections in IA, SC, NC, FL, NJ, or MI? Democrats in congress are doing what we’ve asked – they have pledged to obstruct any and all tax reform efforts until Trump releases his tax returns. And Republicans in congress are starting to come around. Republican representatives in IA, SC, NC, FL, NJ, and MI have said that Trump should release his taxes. If you have any friends in these states, send them an email asking them to call the representatives listed below to thank them and urge them to push harder. Bombs and attacks are not always the answer to global crises, and we must not stumble into another unnecessary war and risk innocent lives in the process. Trump should follow the same procedure as all other former US Presidents and seek the approval of Congress before any military action takes place in Syria, North Korea, or any other location in the world. Please call Senator Markey and Warren as well as your US House Rep. to voice your concern regarding reckless military intervention. Click here for contact details for our senators as well as House Reps. Clark and Moulton. 5Calls.org provides a suggested script. Trump’s budget proposal for the 2017 Fiscal Year allocates over $2.6 billion to begin construction of "the wall" and hire 20 attorneys to assist in confiscating property from Americans who own land along the border. The wall is estimated to cost more than $21.6 billion. It is costly, it is unlikely to reduce illegal immigration and it's an environmental disaster - cutting off natural migration zones for wildlife. There is bipartisan opposition to the wall's construction, but we need voices to declare loud and clear that we do not want a wall. Rep. Clark sits on the appropriations committee. Let her know you oppose the wall. Her contact details are here. The March for Science champions publicly-funded and publicly-communicated science as a pillar of human freedom and prosperity. We unite as a diverse, non-partisan group to call for science that upholds the common good, and for political leaders and policy makers to enact evidence-based policies in the public interest. This group is inclusive of all individuals and types of science! To register and for information, click here. The music starts at 1pm and the speakers start at 2pm at the Boston Common. 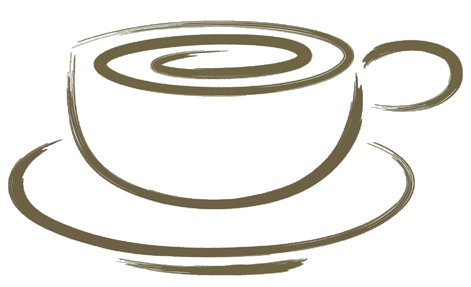 If you would like to carpool to Alewife, please meet at 10am at the LHS back parking lot. RSVP to Andrea. 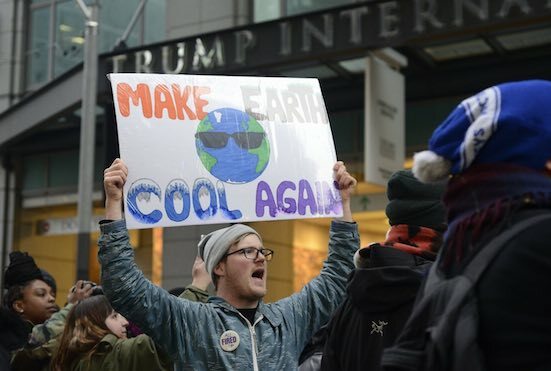 Come join us at a sign-making workshop and make a sign to bring to the April 29th People's Climate March. Even if you are not going to the march, make a sign to place somewhere where lots of people will see it. This workshop is free and all supplies will be on hand for your use. You only need to bring your design idea and a slogan. The Climate March in Washington DC and across the country, including here on the Boston Common. For those that would like to march in Washington, there are buses available leaving from Alewife and other stops, leaving late Friday night April 28, going straight to the march, and then returning Saturday night to arrive back in the Boston area early Sunday Morning. Bus tickets are $100 + handling fee, sponsor tickets are $130. Click here for more information about the march. For Bus Information click here. We will also be organizing carpooling to the Boston march. Stay tuned for more information as the day approaches. 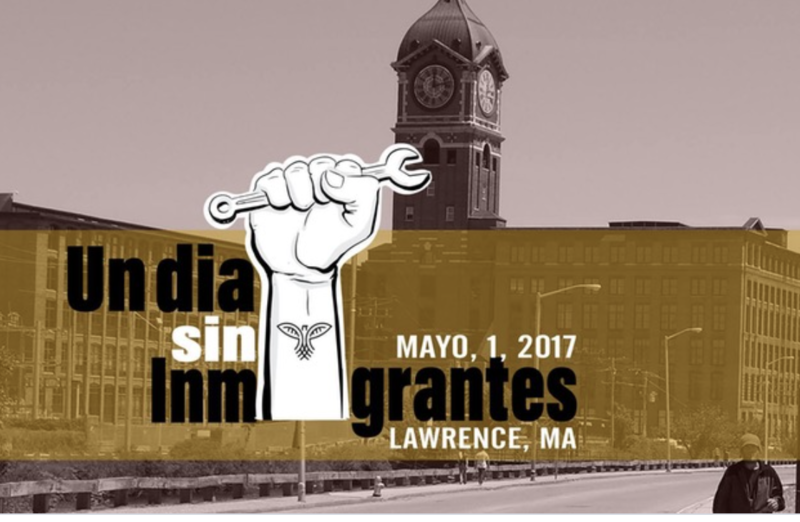 This May 1st, if you are an immigrant and/or believe in immigrants' rights join the national boycott do not go to work, school or buy anything on this day join Cosecha Lawrence and several other local organizations at our Day Without Immigrants march in Lawrence. Join the festivities in the Lawrence Common at 10am for a multi-cultural celebration of this Immigrant City. Lawrence has always been a city of immigrants. In 1912 Lawrence immigrants who demanded better wages and better work conditions made history leading the successful strike "Bread and Roses" that lasted 9 weeks. Let's show the public how much the economy of this country depends on immigrants. For more information or to register for the event click here. JAY KAUFMAN FOUR PART WORKSHOP "DEMOCRACY DEMANDS ENGAGEMENT"
State Rep Jay Kaufman is hosting a four part public workshop as part of his Open House series of public policy forums. The 1st session, “Challenging Times/Building Community,” will invite the public to identify what moves/concerns them and how to unite around these concerns. The second session on May 18, “Identifying and Overcoming Divisions,” will allow attendees to look behind today’s challenges to identify the systemic roots of divisions and those who exploit them for political gain. On May 25, the forum will reflect on what it means to take “Values-Based/Moral Action.” In the final session on June 15, members of the community will look ahead to “What Now? Stand Up, Stand Tall, Stand Together.” Join Jay and other members of our community as we engage in these very important discussions. Items should be no longer than 100 words, and are subject to editing. You may include links to pages with more details.